Mr. Mac Air is such a steady guy! Never gives us trouble. Just goes along forever! This morning, Mac Air's fan began moaning! The fan stops and starts! Do you think that we should send Mr. Mac Air to the Apple Store for doctoring? How do we know if a Scampy Team member is a boy or girl? Well, that is a very good question! We have a website that was created years ago that keeps track of that kind of stuff. Would you like to take a peek? Click [Here] to Warp over there. You have to travel at Giant Warp speed! Because that page is about a zillion years in the past! Yes! You shall be time traveling when you click on that Here link. But please, don't be frightened! Our 9:40am post is a Blog trip thru our Body of Work. The Deepest Blog Post that I have ever made. Perhaps you should take time to really understand what is going on after clicking on that [Here] link? Craftsman 9-Volt Drill Motor disappeared! It happened in lovely Fountain Park. We thought somebody had kiped it! Of course, the drill motor might just be mislaid. So, we waited, and did not buy a replacement. Yesterday we were looking for something inside Tránsito. In the large extension drawer on the left forward side, there is was! The drill motor! Wow! We are sooooo happy about finding it! Also yesterday, we brought the drill motor and its battery charger into Scampy. But we never got to doing that charging. This morning we saw the charger sitting on one of Scampy's bench seats. When we went to go charge the drill motor, we could NOT find it! Darn! That damned Craftsman Drill Motor is cursed! The Scampy RV Team is heading north on Interstate-5. We are going to visit with our friend Rowena. We have to get a smog certificate for Tránsito in order for Tránsito to be properly registered with the DMV in Oregon. Coming up behind us, we saw the meanest-most evil looking big rig we had ever seen! We stopped along the Interstate and looked up Trajectory Trucking Inc. We found their phone number, and called them! We asked for the driver's phone number, and explained how much the look of that truck impressed us. "His name is buddy. He would like to hear what you have to say about his rig." And he gave us Buddy's cell phone number! So we phoned Buddy and told him that he passed a small white travel trailer about 15 minutes ago. The trailer has a decal with the name "Scamp" on it. 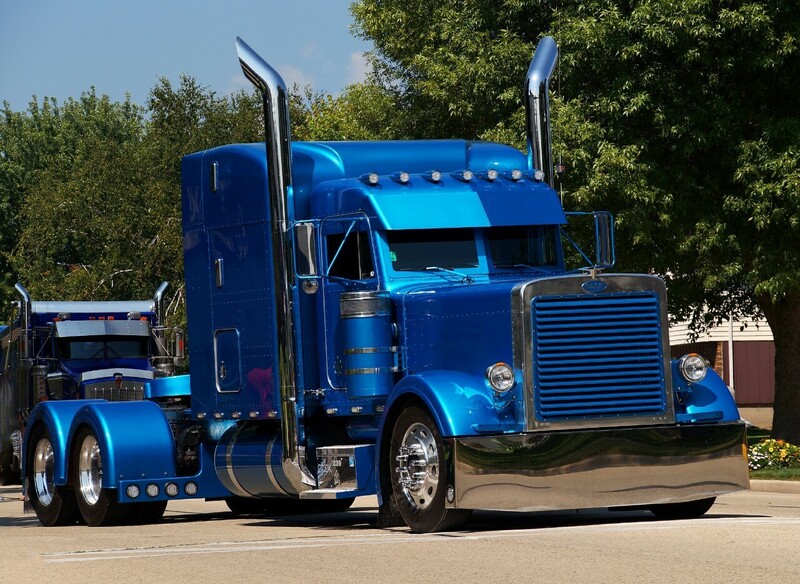 We told Buddy how much we loved what he had done rebuilding his Peterbilt rig. 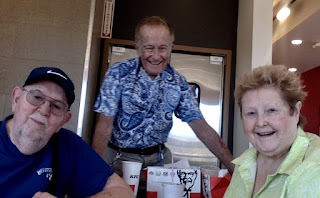 I went to KFC for some food. Sitting at the next table were a senior couple. We had a lot in common. And talked together for about an hour! Their names are Patty and Larry. I mentioned to them that I had a blog, and would like permission to take a pic of the three of us in the KFC and publish that pic with at story. They gave me permission! Remarkable that they had the guts to buy a house at this time in their life! The Scampy Teams has taken its sweet time driving to visit with our friend Rowena [aka Weng]. Rowena is a Landscape Gardener. She works for herself and has a few part-time helpers. From my time spent chatting with Rowena's clients, a very good and respected Landscape Gardener too! This day, Rowena began working at 6:30am and stopped at 6:30pm. Twelve hours! Rowena was really starving. I offered take her out for supper. It is the middle of the afternoon on Saturday. I've still not completed this Blog of mine from Friday! I believe that it is time for me to close this Friday Blog post. Perhaps I'll put the posts that remained on published on my Saturday Blog. I wouldnt use it much if the fan is moaning. I had a computer fry shortly after my fan quit ( an oooold 386! ) You can probably replace it yourself George. More tweaking for you! I am taking your advice [not using the Mac]. I had a fan replaced last year. No big deal, it would come close to overheating. Didn't cost much. I don't know about Mac. I'm going to find out about cleaning out the fan. It's probably dust that is causing the fan to make noise. Just came across this video that was posted today about converting a Transit Connect. Thought you might like to see it. Take care George! Thank you sooooo much for sharing that video! I agree with the woman who owns a Ford Transit Connect and is living in her Transit part time. The Transit is a remarkable RVing kind of vehicle! George- thinking of you. Jeanette and I are dinning at Nancy's Burgers. Hiya George, this is Charlie (Rolling Earthquake ) ..My buddy was a computer guru..he told me to vacuum out the vents on my laptop..just hold the vacuum there for a few minutes..removes a lot of yuk.. I have a portable vacuum. I shall give that a try! Thank you for your comment/suggestion. You should vacuum out computer fans regularly. Typically there is one place the air goes into and one exit, at least on a laptop. First, vacuum by the entry, then hold the vacuum against the exit and use canned air, blowing in short bursts through the entry. This will most likely help. You should listen to the fan before and after so you can hear if there is a difference. Do this while it is running. The apple guys will be able to perform a more thorough cleaning... And they should be able to test the fan for you. Very good of you to send your comment/suggestions. Canned air is now on my shopping list!